They look like a beautiful addition to your flower bed, but the weed, wild violet, can be very dangerous to the health of your lawn. Violets can mostly be seen around your yard in shades of purple, blue and sometimes even white. This is one of the prettier weeds, but don’t hesitate to get them out of your lawn as they can jeopardize the lawn you’ve worked so hard to achieve. For more information about this weed and how to get rid of them, read on! Violets, or viola sororia, are a broadleaf, herbaceous, or a non-woody stem, perennial plants. Wild violets are sometimes also considered herb plants, because they have some medicinal qualities. The foliage is most times heart-shaped, but may also taper to a fine point, with waxy feel to the surface of the leaves. They grow to be about 4-6 inches in length with a fibrous root system. They are also self-fertilizing and this makes them very difficult to remove. What areas do they prefer? Wild violets prefer partial sun to partial shade with moist to average soil. However, these wildflowers are very tough plants and do not need a specific climate to survive, as they can survive very dry temperatures. How do I get rid of this weed? Getting rid of this weed is particularly tricky and treatments for controlling wild violets are best applied in the fall, but don’t fret, you can still get rid of those pesky flowers in spring! Use the right herbicides- Professional lawn care companies use an array of weed control products for maximum effectiveness, but those materials may not be available for public purchase. Finding a herbicide that specifically states that it will kill wild violets is your best option and it will take a couple of applications before the violets are controlled. 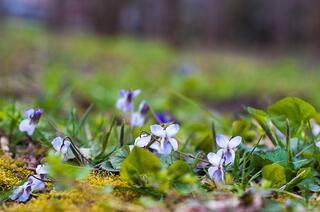 Control the pH of your lawn- Violets grow more in soil with very low pH and grass plants prefer soil with higher pH. By testing your soil and creating an environment that is best for your lawn, you will be able to create a less suitable environment for the wild violets and an environment that your grass plants will thrive in. You can also core aerate your lawn, relieving soil compaction and improve drainage which your grass plants will prefer. Stronger and thicker lawns are better- By filling in thin or bare area of your lawn, there is a lesser chance that the violets will stand to spread. This is a great time to seed your lawn. Repeat, repeat, repeat- Depending on how many wild violets are in your yard, it may sometimes take years to get it fully under control. These weeds are persistent and will try to come back, just keep at it and stay proactive.